Original Antique Maps and Prints. 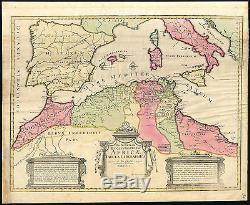 Antique Map-NORTH AFRICA-MEDITERRANEAN-MOROCCO-LIBYA-ITALY-SPAIN-De L'Isle-1745. Description: Original antique map by Guillaume de L'Isle, published in France ca. Artists and Engravers: The de L'Isle family was one of the most influential Geographers of the early 18th century in France. Claude de L'Isle, born 1644, had four sons, of which Guillaume was the most notable. Guillaume was born 1675 and became member of the'Academie Royale des Sciences' with the age of twenty-seven, and was honoured later with the title'Premier Geographe du Roi'. His largest project, the'Atlas de Geographie', was published until 1774 in Paris and Amsterdam (Covens and Mortier). This maps was engraved by John Senex. Subject: Map :'In Notitiam Ecclesiasticam Africae Tabula Geographica. Interesting map of the Western Mediterranean, from Italy, Spain and the Balearic Islands to Morocco, Algeria, Tunisia and Libya, based upon an earlier map by Johann Baptiste Liebaux. The map provides a highly detailed treatment of the roads and trading routes in North Africa. Condition: Size (in cm): The overall size is ca. The image size is ca. 62 x 47.5 cm. Size (in inch): The overall size is ca. 26 x 21.3 inch. 24.4 x 18.7 inch. Medium: Engraving on verge type hand laid paper. ThePrintsCollector Peter Cornelissen, Margo van Latum - van Dongen, Frank van Latum Zeeland - The Netherlands. We guarantee our items to be genuine original. GO TO OUR STORE and explore our huge collection of fine antique maps and prints. FIND SIMILAR ITEMS IN OUR STORE. Visit our Store: we would like to invite you to review similar items in our Store or to browse through all other items in our Store. We are confident that you will find very special unique antique maps and prints in our Store. It is our privilege to have you as a customer. The item "Antique Map-NORTH AFRICA-MEDITERRANEAN-MOROCCO-LIBYA-ITALY-SPAIN-De L'Isle-1745" is in sale since Thursday, September 17, 2015. This item is in the category "Antiques\Maps, Atlases & Globes\Africa Maps". The seller is "theprintscollectoruk" and is located in Zeeland. This item can be shipped to North, South, or Latin America, all countries in Europe, all countries in continental Asia, Australia.